Curbside recycling programs have evolved over time. The focus of early recycling efforts encompassed materials such as newspaper, glass, aluminum cans, and tin cans. These items were separated by residents for curbside pickup and then collected by trucks that contained multiple compartments--multi-stream recycling. The number of materials being recycled could not be easily expanded: Because of compartment limitations on collection trucks, the opportunity for the introduction of new scrap materials for recycling as limited. More labor-intensive collection: Because materials had to be dumped into the appropriate compartment of the truck, there was more pedestrian travel time and handling at each stop. Longer stops: The extra handling at each stop not only translated into more labor, addressed above, but also less efficient utilization of trucks. More burden on residents: More bins for segregation translated into more complexity and space requirements for recycling participants, and the greater likelihood of more recyclable material just ending up in the trash. Single stream recycling emerged as an approach that offered greater efficiencies in seemingly every category. The number of products acceptable for recycling could be expanded without adding any bins, handling and length of time at stops by truck drivers were minimized, and trucks could be completely filled versus having to stop when one compartment was filled. Additionally, single-stream recycling was seen as a much more convenient approach that would result in increased household recycling participation. 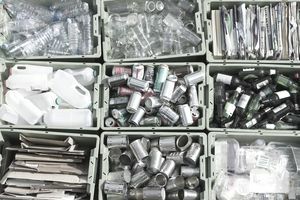 There has been some debate as to whether the boost in recycling rate is due to the convenience of a single stream, or to public education programs that often accompany the launch of new recycling initiatives. Recyclers have been faced with increased costs associated with sorting mixed materials in single-stream collection systems. At the same time, they have been pressured by lower scrap prices and decreases tolerance for scrap contamination by foreign markets. As such, communities that have not yet switched to single-stream recycling may wish to explore the issue at greater length. In spite of the extra costs associated with a dual stream approach, this is offset to some extent by higher quality recycled material recovery. Community initiatives and supporting partners seem to be focusing on better education and communication to help reduce recycling errors. For their part, recyclers are increasingly looking at contractual opportunities to seek compensation from communities if contamination levels exceed stipulated amounts. As a curbside recycling participant, the most important role you can play is by ensuring to do your part in maximizing diversion from the trash, while following your community's guidelines with respect to allowable materials.